Waseda University , abbreviated as Sōdai, is a Japanese private research university in Shinjuku, Tokyo. Founded in 1882 as the Tōkyō Senmon Gakkō by Ōkuma Shigenobu, the school was formally renamed Waseda University in 1902. Waseda is organized into thirty-six departments: thirteen undergraduate schools and twenty-three graduate schools. As of May 2016, there were 42,860 undergraduate students and 8,269 graduate students. In addition to a central campus in Shinjuku, the university operates campuses in Chūō, Nishitōkyō, Tokorozawa, Honjō, and Kitakyūshū. Waseda also operates twenty-one research institutes at its main Shinjuku campus. The Waseda University Library is collectively one of the largest libraries in Japan and currently hold some 4.5 million volumes and 46,000 serials. Waseda consistently ranks among the most academically selective and prestigious universities in Japanese university rankings. 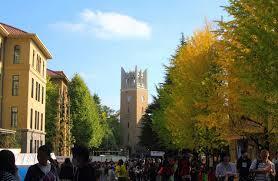 It is often ranked alongside Keio University, its rival, as the best private university in Japan. In 2015-2016, Waseda ranked 212th in the QS World University Rankings. Waseda is among the top type of the select Japanese universities assigned additional funding under the Ministry of Education, Culture, Sports, Science and Technology’s “Global 30” Project to enhance Japan’s global educational competitiveness. Waseda has graduated many notable alumni, including seven Prime Ministers of Japan, numerous important figures of Japanese literature, including Haruki Murakami, and many CEOs, including Tadashi Yanai, the CEO of UNIQLO, Nobuyuki Idei, the former CEO of Sony, Takeo Fukui, the former President and CEO of Honda, Norio Sasaki, the former CEO of Toshiba, Lee Kun-hee, the Chairman of Samsung Group, Mikio Sasaki, the former Chairman of Mitsubishi, and Hiroshi Yamauchi, former President of Nintendo. Waseda was founded as Tōkyō Senmon Gakkō on October 21, 1882 by samurai scholar and Meiji-era politician and former prime minister Ōkuma Shigenobu. Before the name ‘Waseda’ was selected, it was known variously as Waseda Gakkō or Totsuka Gakkō after the location of the founder’s villa in Waseda Village and the school’s location in Totsuka Village respectively. It was renamed Waseda University on September 2, 1902 upon acquiring university status. It started as a college with three departments under the old Japanese system of higher education. In 1882, the university had the department of political science and economics, law, and physical science. Along with these departments, an English language course was established, where the students of all the departments could learn English. Three years later, the department of physical science was closed because it had too few applicants.The department of science and engineering was established in 1908. The department of literature was established in 1890. 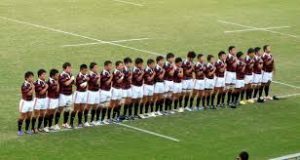 Although Waseda formally adopted the term university in its title in 1902. it was not until 1920 that, in common with other Japanese schools and colleges, it received formal Government recognition as a university under the terms of the University Establishment Ordinance. The department of education was established in 1903, and the department of commerce, in 1904. Much of the campus was destroyed in the fire bombings of Tokyo during World War II, but the university was rebuilt and reopened by 1949. It has grown to become a comprehensive university with two senior high schools and school of art and architecture. Ōkuma had long desired to create an academic cap so distinctive that someone wearing the cap would immediately be identified as a Waseda student.The chief tailor of Takashimaya, Yashichiro, was called upon to design a cap in three days. Each square cap was stamped on the inside with the student’s name, his department, the school seal and the legend, “This certifies that the owner is a student of Waseda”. Thus, the cap served as a form of identification, and effectively a status symbol. The cap, with its gold-braided badge, is registered as a trademark.